I’ve been reading and reading about all the wonderful benefits of consuming bone broth. Seems like everybody and their brother is making some. The Atkins book, The New Atkins for a New You], suggests broth for avoiding some of the unpleasant side effects of first transitioning to low carb. The folks I know who have tried it heartily recommend it, so I decided to give it a go! Have an Instant Pot/Pressure Cooker? Try my updated recipe: 2-Hour Instant Pot Bone Broth! Bone broth is the made from bones, plus maybe some meat and vegetables, cooked in water until it’s gradually reduced to a flavorful liquid. The broth is then strained. While stock is cooked maybe 4-12 hours, bone broth is cooked over a longer period than ordinary stock in order to more fully extract the nutritional content from the bones. Depending on the type of bones you are using, 24 – 72 hours may be appropriate. Basically, we’re looking at cooking the bones to the point that they are soft when pressed between the fingers, bordering on disintegration. Why would I want to eat bone broth? Bone broths are rich in nutrients, minerals and amino acids. Bone broth has the amino acids, proline and glycine. It has calcium, magnesium and potassium. Bone broth has proteins, collagen (which turns into gelatin), and glucosamine (like what’s sold in supplement form for joint pain). It’s good for inflammation, joint health, easy on the digestive system, cheap to make and utilizes ingredients you’d otherwise throw away. How awesome is that? When I was ready to get started, I read 101 recipes to get as much info as a could. After seeing so many techniques and suggestions, I felt I had a good handle on the process. While some people use a large stock pot or even pressure cooker, I don’t have either and I was more comfortable leaving my slow cooker on for long periods than leaving the stove on overnight, anyway. Step 1: Collect Bones! Although some people buy bones for their broth, I wanted to make use of what I had. People will suggest using the best quality bones possible (i.e. 100% organic, grass fed, etc.). While it makes sense to me the better quality ingredients you start with, the better the outcome will be I didn’t really sweat the particulars here. I figured I would start where I’m at and use bones from the meat I am already eating. So I started a bag in the freezer and threw bones in it after meals–this batch was probably a couple of chicken’s worth, a steak or two and a turkey. Yum, Turkey! I also threw leftover vegetables in a baggie in the freezer–celery that was past it’s prime, bits and pieces of onion that weren’t fresh enough to serve as is, the ends of zucchini from my zoodle-making, and some carrots I hadn’t used up. I’d recently made some fire cider, and had a mess of veggies and fruit from that operation as well, which I popped into the freezer until I was ready to make my broth. You can really use whatever you want, other than leafy greens like spinach and kale, because those become bitter if cooked over several hours. Once you have your bones and veggies saved up, you’re ready to rumble! 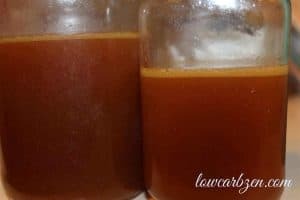 This tasty bone broth can be drank straight - great warmed up with a little butter - used to flavor meats for cooking, as the base in soups, or any other way you would use stock or bouillon. Ingredients besides the bones are merely suggestions to get you started. Lots of Bones! Small bits of meat, cartilage and gristle remaining add to the broth's flavor and nutrition. The cartilage pieces help create gel. Spread frozen bones and a cookie sheet covered in foil, and roast about 30 minutes. When the bones are nice and roasted, add them to the slow cooker. Scrape any leftover juice or baked bits from the pan into the slow cooker as well for extra flavor. Fill the slow cooker about 1/4 of the way or so up with water. I was concerned I didn't put in enough water, but it ended up being more than I needed as it was nearing the top of the pot while it cooked. Add the Apple Cider Vinegar. Don't add the veggies yet! Check from time to time. I discovered my slow cooker shuts itself off after 12 hours, so I had to restart it a few times when it went off in the night. I was aiming for 3 days, though I probably lost a few hours due to the auto-shutoff. So I estimate my batch was cooked between 60-72 hours in total. On the last day, add your veggies. If they are there from the start, they will totally turn to mush before your broth is done. You know the broth is done when the bones become soft and you can easily dent or crush them between your fingers and your veggies are mush. Allow the broth to cool down enough to work with. Strain broth and put about a weeks worth into a jar to refrigerate. The rest I put into ice cube trays, and set in the fridge in preparation to freeze. Don't worry if it looks completely gelled when it cools. That's what you want! The more gel, the better the broth is. I keep the cubes bagged in my freezer and pulled a few out to heat in a cup with some butter mixed in, cook with meat or add to soups. For the bones: I used primarily turkey and chicken bones, with a couple of steak and ham bones tossed in for good measure. Evidently, chicken feet increase the gelling factor, which is a sign your broth has lots of collagen and is especially potent. I didn't have any chicken feet. Most of the recipes I saw used a tablespoon or two of Apple Cider Vinegar. I am not sure why so little, but I love the benefits of ACV and I had plenty on hand so I used more. It helps leech the nutrients out of the bone, and I wanted to get the most out of it. It did not make the completed broth taste of vinegar in the least. You can also add lemons; they serve the same function plus add a little flavor. Some people skim the foam a few times early in cooking, or skim the fats off after cooking, especially if they are concerned about the quality of meat. Mine didn't seem to have a lot of either foam or fat, so I didn't bother with it. Random tips: I’ve heard people say they do more than one batch with the same bones. I think if you cook it long enough, there won’t be much of the bones left to do additional batches. I found using a Nut-Milk Bag PERFECT for straining. I also prefer ice cube trays to jars for freezing because if it expands too much, your jars can shatter in the freezer. Oops! A bone-brothed freezer does not a magically easy slow cooker bone broth success make! Update, 10/15: From my experimentation, I’ve learned that allowing the broth to cool some when my slow cooker times out overnight really helps the gel factor. I’ve been cooking this two days at a time, adding veggies the second day and allowing the pot to go off for a few hours at night produces an awesome gel. Nutritionals not provided because it’s going to depend entirely on what ingredients you use, but we’re talking a small number of carbs related to whatever veggies you use. And since you don’t eat the actual vegetables, I’m confident it will be minimal. Have you made an easy slow cooker bone broth? How did yours work out? 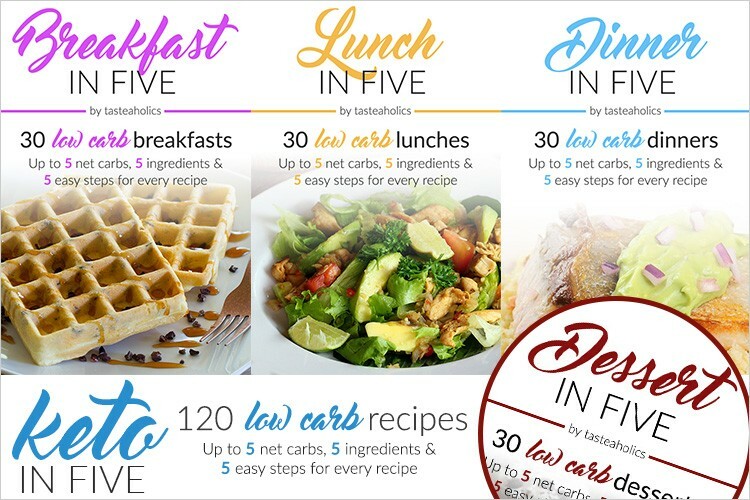 New Atkins for a New You suggests that fatigue, lightheadedness, constipation, and leg cramps indicate a need for sodium and balancing electrolytes when first transitioning to a low carb regime. The diet initially has a diuretic effect. A cup of broth twice a day is one of the suggested remedies. Some feedback from Cristal on the Facebook post of this recipe: Great post… But…3 days is a bit excessive, even on low. Also, use one kind of bone per batch to get a distinctive flavor, not a good idea to mix bones. and a chef trick is to add tomato paste to the roasting bones an hour before completing the roasting bones to get a depth of flavor / color. Adding fresh herbs to broth is a good idea with the veggies. I made the bone broth with all beef bones this week, and cooked it on low in my crock pot for 3 days. It made a very rich, brown broth, but doesn’t appear to have gelled the way I’d hoped – and the bones are every bit as hard as they were the day I put them in the pot – they didn’t soften or disintegrate at all. I followed the recipe to the letter in terms of ingredients and quantity, and made sure I added the ACV (Bragg’s). Any thoughts? I’m sure it will still be a great soup base, as it has a very deep beef flavor, but I really wanted it to gel, because that would indicate the presence of the chondroitin, gelatin and collagen that I wanted in the broth. It’s been in the fridge for 3 hours now and is still liquid. Thanks for any thoughts you may have on this. Types of bones – Recommended about half joint type bones, like chiken feet, wings, necks, ox tails or cow knuckles. Too much water/without enough bones or too much heat can kill the gel, too. Some folks say that the free-range, organic/whatever type of meat that has been feed a better diet gel better because they have had better nutrition. Someone mentioned their turkey bones always gel. This batch pictured had a turkey in there, so that may have helped! From what I understand, it’s still very nutritious even without the gel showing up (and the good stuff is still there, just not as concentrated) so while it was disappointing not to have that “gel confirmation” I’m still using mine. I will just try again using these pointers next time. Good luck! Where do you get your bones? Do you just save them from other meals you cook? I don’t cook much meet with bones. Usually boneless chicken or steaks. If I went to the butcher at the grocery store, would they have bones I could have (or buy)? Thanks. I use bones from my cooking, but you can also get them from the butcher for example, or I’ve seen people say they call up local farmers to source their bones. You can use the same kinds of meat or mix it up, but it alters the flavor what type of bones you use. The batch I made from turkey bones was delicious! Oxtail is one I see mentioned frequently and additions that have a lot of collagen (like chicken’s feet or pig knuckles) will add to the gel. If you have a source that bones from organic, grass-fed meat, that’s recommended for the best quality and healthiest broth. Basically I do the best I can with what I have to work with. FYI, after ongoing experimentation, I’ve had great luck getting gel by letting the broth cool somewhat at night (when my slow cooker automatically times out). I suspect the sustained cooking is just a little too hot. I cannot really give you specifics because I’m not rigidly controlling when the cooker goes off and for how long but if you’re not getting your gel, I’d try a “pause” in cooking to see if that helps!